While there has been controversy over Intel's soon to launch 28 core CPU, many have been eager to see it in action at least out of sheer curiosity. For anyone that was thinking about buying it, Threadripper might look like a more appealing option since the Xeon W-3175X is over $4000. 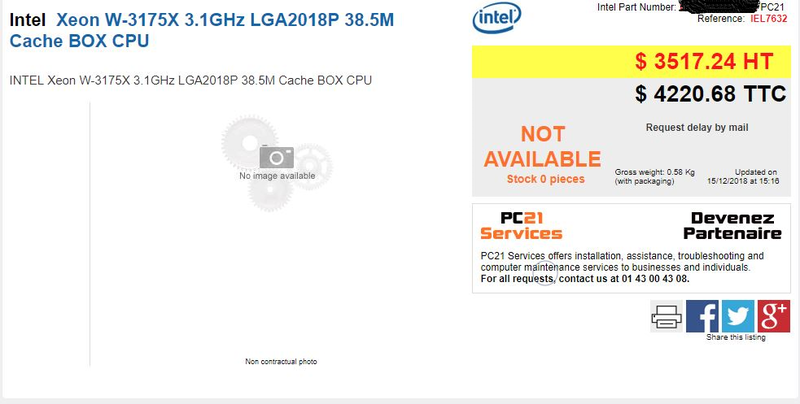 After demoing a 28 core CPU aimed at consumers at Computex under very misleading pretenses, Intel finally announced in October that the 28 core CPU would be launching in December (this very month) as the Xeon W-3175X, and it seems the CPU will be available soon according to several listings popping up on internet retailers. While a 28 core consumer Xeon with 6 channels and 44 PCIe lanes is an incredible CPU for serious professionals, some will surely shy away from it's apparent $4000 pricetag. While it is far cheaper than its server counterpart (which is over $10000) and is a slightly more modern CPU, $4000 is perhaps a price no consumer CPU has ever hit. The Xeon W-3175X has almost no counterparts in terms of price, which is quite unfortunate because its immediate competitor in performance is the Threadripper 2990WX from AMD, and it's less than half the price at $1799, and it has 4 more cores, similar clock speeds, 20 more PCIe Lanes, and almost twice the cache. The 2990WX was reviewed very favorably, and although performance on some tasks is very lackluster due to only having 4 memory channels, the 28 core Xeon will have a tough time competing since it's twice the price, has less PCIe lanes, and is based on a very niche socket. While there is no doubt that the Xeon W-3175X will be fast and that it will probably be faster than the 2990WX, it might not be fast enough to justify spending another $2000 or more.